Brazil 2010 - Free Practice 3 // Can anyone top Red Bull as they lead in Interlagos? Red Bull were on top form yesterday, taking the top two spots on the timesheets for both practice sessions. Ferrari seemed off pace in FP1, but Alonso in particular was right behind his opponents during FP2. This morning, we have an hour of practice before qualifying gets underway, but the conditions aren't looking very good. Lots of the tweets I am seeing flying around from Brazil are talking of the very heavy rain. Force India suggest it is due to carry on throughout the day. Mercedes say it is "throwing it down" and Adam Cooper points out the F3 support race began with enormous spray, just like Korea. 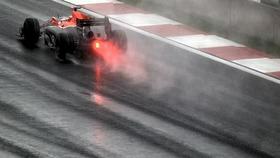 Hülkenberg is fighting for his seat at the moment, and it's not clear whether the rain is going to help him out or not. Yesterday, he wasn't particularly sure that Williams would be able to get through to Q3 or not. It looks very competitive out there this weekend so I think it could be quite a difficult task to get into the top 10 tomorrow. Personally, I didn't get a very clear run on the option on low fuel today but everything else went well. We still have to improve the car ahead of qualifying so we have work to do. The rain today will halt their plans for running setup simulations and the like, but if it continues to rain it might be good to get some wet running in. Will any cars actually bother to hit the track in the rain? Will we see anyone slide off into the barriers? Will Red Bull still be fast? Who will be on top ahead of qualifying?